Smoke Rise Riding Club shows are organized by the members and their families for you and your family. Our showground is within the lovely Smoke Rise community in Kinnelon, New Jersey. Smoke Rise has been nominated several times for NJHSA Horse Show of the Year. Smoke Rise Riding Club was the recipient of the 2018 NJ Horse Show Association’s Horse Show of the Year Award. Riders/horses accumulating the highest cumulative point totals from all Smoke Rise sponsored public horse shows receive Grand Champion awards and prizes at the end of the season. Our show season includes eight USEF licensed shows. 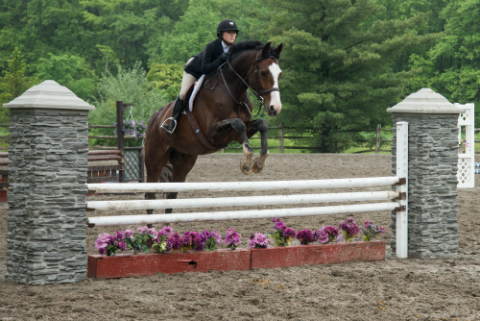 All shows offer NJPHA, NJHSA, and M&S classes. We run US Equestrian Federation and US Hunter/ Jumper Association divisions as well as NJ Horse Shows Association, NJPHA, and Marshall and Sterling classes. Divisions include Itty Bitty Jumpers, Pre-Preliminary Jumpers, Child/Adult Jumpers, Junior Equitation, Open Equitation, Hopeful Hunter, Schooling Hunter, Junior Hunter, Children’s Hunter, Adult Equitation, Adult Amateur Hunter, Preliminary Adult Hunter, USHJA Outreach Program including Leadline, Elementary Rider, Secondary Rider, Camp/Academy, Beginner Rider, Beginner Hunter, Mini-Stirrup Equitation, Short Stirrup Equitation, Short Stirrup Hunter, Pre-Children’s Equitation, Pre-Children’s Hunter and Pleasure Horse or Pony. Save time at the shows by pre-entering on Horseshowing.com or print the below entry form, fill it out at home and fax it to the show secretary prior to show day. The following information will provide guidance regarding the Grand Champion Awards.